2) Let rest in a warm place until bubbly. This is referred to as your "sponge"
as starter for your future bread batches. 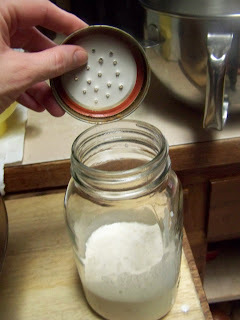 4) Cap your starter loosely and refrigerate. 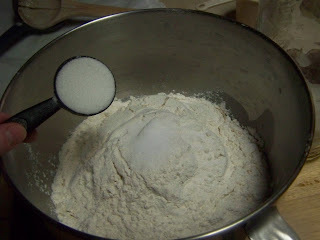 5) For each cup of sponge, add 2 cups of flour. 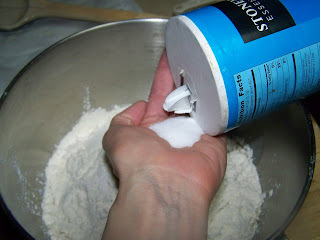 7) Add sugar if desired. 8) Mix and knead until smooth and elastic. Let rise in warm location until doubled. 10) Place in greased pan(s) to rise. 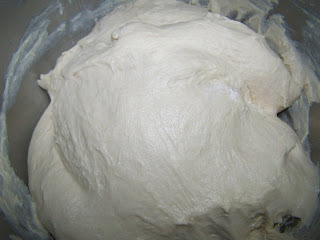 prior to moving to cooling rack. * Sourdough starter becomes more potent both in it's leavening abilities and in it's sour taste with frequent use. * Patience is key with sourdough. 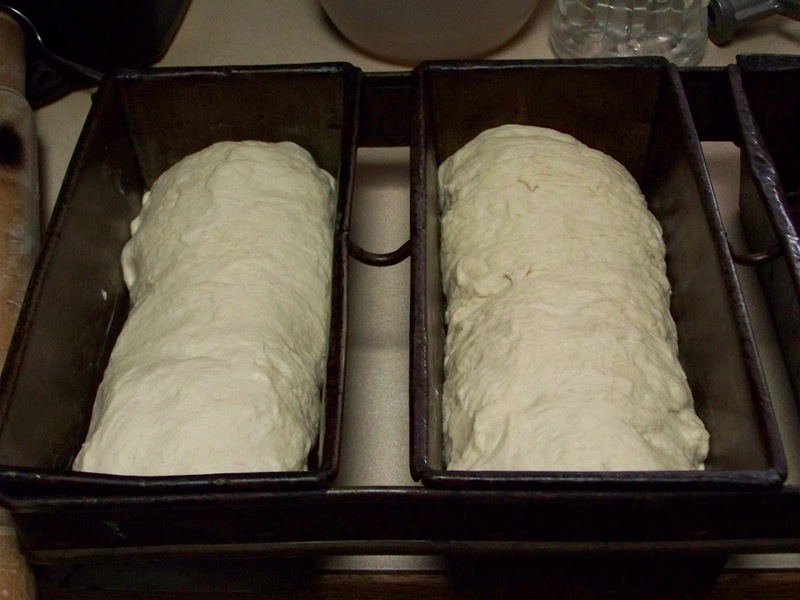 It may take longer to rise than bread leavened with commercial yeast. On the flip side, I've had sourdough perform just as well or better than commercial yeast. So, watch it carefully and expect it to take a while. *Remember to save starter out of your sponge each time for next use. Don't be afraid to experiment with the ingredients you add to your sourdough bread, just be certain to take your starter reserve out of your sponge PRIOR to adding other ingredients. 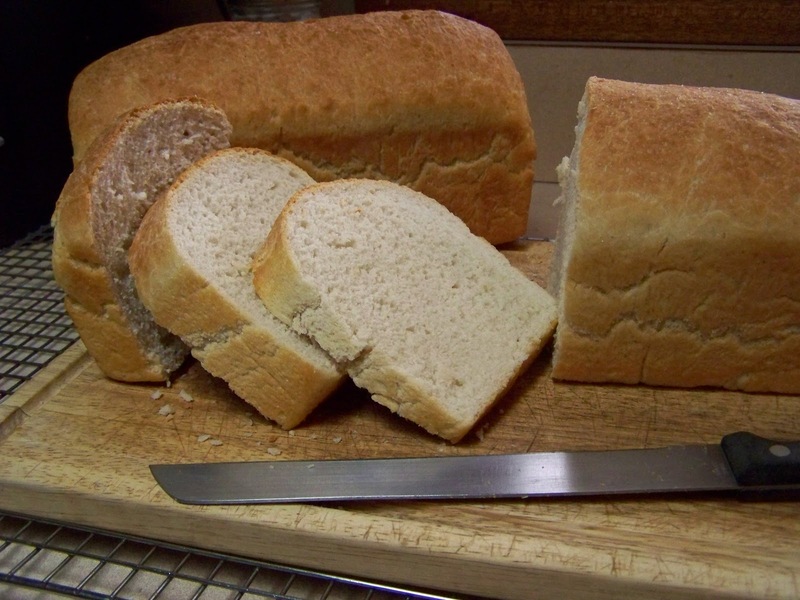 * If you make bread at least once a week you shouldn't need to feed your starter. 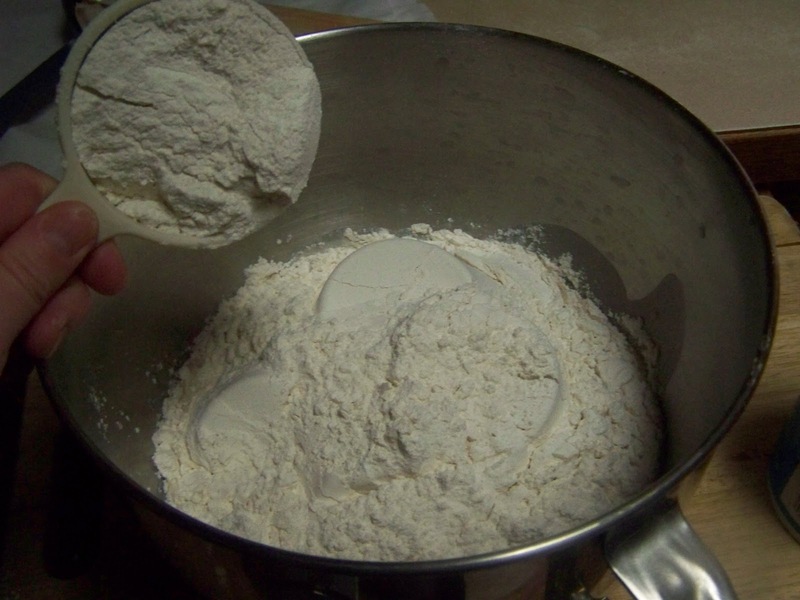 If you don't make bread that often, you will want to feed your starter by stirring, pouring off about 1/2, adding equal parts lukewarm water and flour. 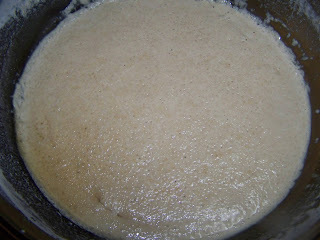 Cover loosely and leave at room temperature until starter begins to bubble. Then return to refrigerator. * A good rule of thumb when figuring how many loaves you will be making is to use one cup of starter with 2 cups of flour per loaf. You may need to add more flour. 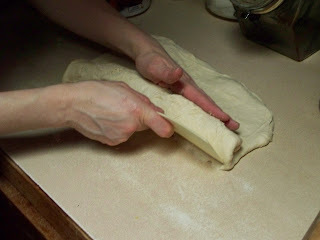 In fact, it is better to start with less and add a little flour at a time until smooth and elastic. Happy bread making! Feel free to share your favorite bread recipe. Your bread looks absolutely divine. I know you are enjoying it. Pass the butter please! Thank you Bonnie for stopping by! I wish I could give you a slice, it did turn out really well! It's a shame that Sourdough bread is not widely known here in the UK. You certainly make it sound easy to do. I really appreciate your visit! Sourdough really is easy. Sometimes it takes longer to begin that bread made with commercial yeast. I'm speculating that is why more people don't give it a try. But honestly, once the starter is live, it is the easiest method. 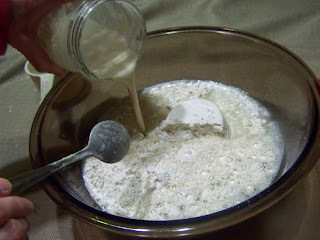 Seems like one could keep themselves in a regular habit of making bread just by using sourdough starter. After all if you don't feed the starter once a week, it could weaken or die. Thank you for mentioning Becky's blog! You're right, we do seem to have a lot in common! 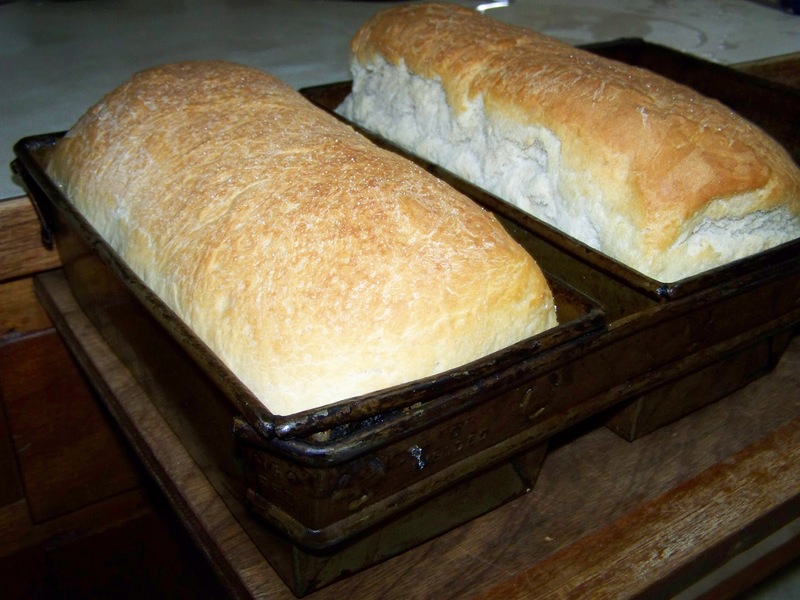 Your loaves are absolutely gorgeous. Love the idea of the holes punched in the lid. 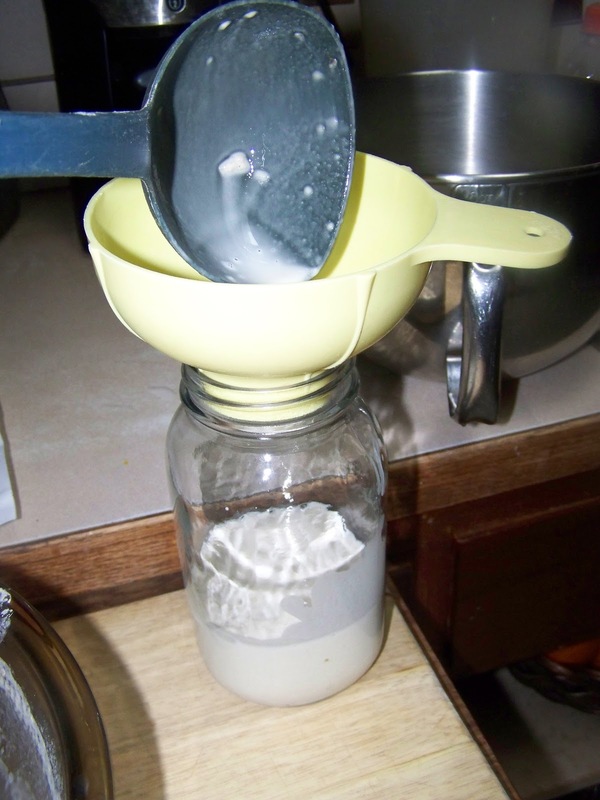 I need to try that, next time I make a sourdough starter, which won't be until after my kitchen is done. :o I managed to keep the last one alive for over a year, but, it died. Maybe I'll do better next time! Thanks Leigh! I'm sure you'll be glad to get your kitchen finished and NOT just for the sourdough! It is really quite simple isn't it? As long as you remember to feed the critters, it just keeps on producing! Thanks to Mark for showing me this blog! 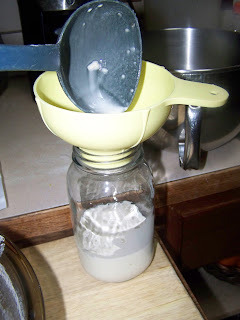 I have a sourdough starter going too but have yet to get around to making bread. Hopefully this weekend I can get to it. I have used it for several other things though. Your bread rose really well. I hope mine does as well as that. It's very nice to have you here! I think your bread will do well as long as you have a nice warm kitchen and continue to feed your starter. I'd love to know what else you've used your starter for. I've made pancakes with mine before. I'll have to come by and visit you in a bit. I have used it for waffles, pancakes, in biscuits, as breader for chicken, steak and pork chops, I have made bread before but not with the current starter I have. There are some recipes on my board under the sourdough tab. I'm heading back over to check it out right now! I forgot the pizza and it is one of the best things to make!